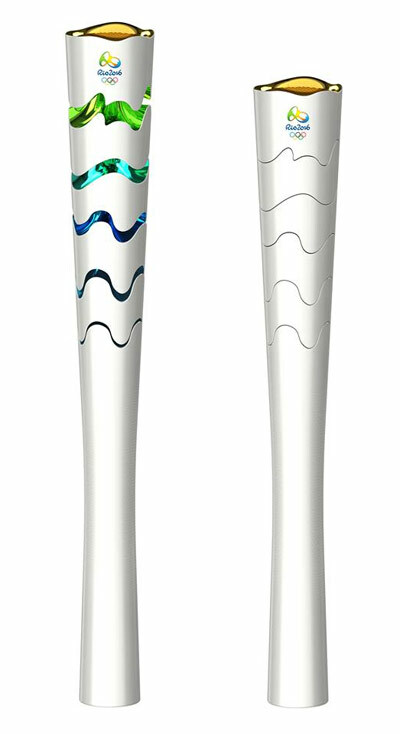 Rio 2016 unveiled it’s Olympic Torch Friday. The Olympic spirit is present in the torch’s texture with triangles running the length of its body, alluding to the three Olympic Olympic Values of excellence, friendship and respect, and in the floating effect of its different segments, referring to the efforts of the athletes. One of the main features of the torch is the movement of these segments, which open up and expand vertically when the Olympic flame is passed from one torchbearer to another. When expanded, the segments reveal the elements that add the Brazilian flavor: harmonious diversity, contagious energy and exuberant nature, with the soil, the sea, the mountains, the sky and the sun represented in the colors of the Brazilian flag. The flag’s design was the result of a nation-wide competitive tender that 76 agencies responded to. Around 12,000 torchbearers will carry the Olympic flame across some 300 cities and towns in the 26 Brazilian states and the Federal District, for 90 to 100 days. The relay begins in the capital city of Brasilia when the Olympic flame arrives in May 2016. There will be around 12,000 torchbearers and the flame will travel along approximately 20,000 km of Brazilian roads and fly 10,000 miles over the North and Midwest part of the country between the cities of Teresina and Campo Grande. The torch relay ends on August 5, 2016 when the last torchbearer will light the Olympic Cauldron during the Opening Ceremony at the Maracana Stadium. The torch relay convoy is expected to visit 500 cities and towns. The route will be revealed at the start of 2016. Rio 2016 President Carlos Arthur Nuzman said, “we want to show the world the chemistry that we believe will be born when the Olympic Flame meets the warmth of the Brazilian people. It will be impossible to mount such a logistical plan without working together with the governments and their public servants, such as in security, traffic control and public order. Some cities will organize celebrations to mark the end of the Torch Relay every day”.